How do you measure the success of your website? With Google Analytics alone, you have an overwhelming amount of data at your fingertips. 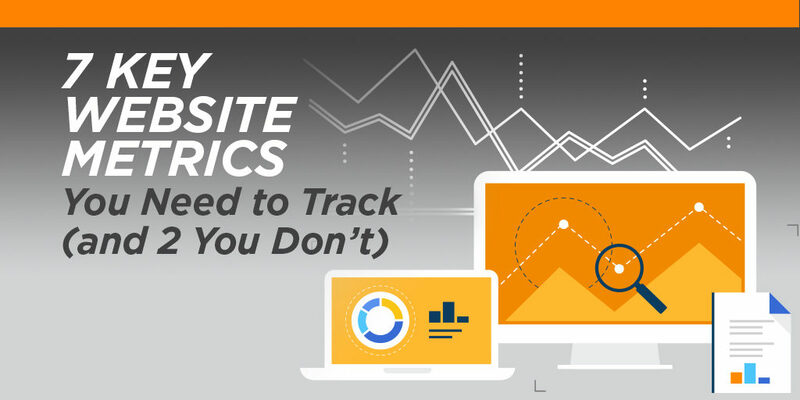 You can’t measure everything, so which metrics are important for your website? Every business is different, and every website has different goals. Regardless, the metrics you should be focusing on are the ones that produce meaningful insight for your business. You need metrics that provide actionable data so you know how well your website is performing, and how you can improve. Find out 7 key metrics that can make a difference for your business and 2 that might be distracting you. Let’s start with the obvious – you want to know how many conversions your website is generating. In most cases, this is going to be a phone call or a form fill. If you have an e-commerce site, a sale is obviously the crucial conversion that you’re tracking. However, you may have other conversions that are important for your business, such as subscriptions, comments, reviews or social shares. What you consider a conversion will depend on your business and your goals. Identify what types of conversions impact revenue for your business and make sure you are tracking them. Conversion rate is a good starting place to judge which pages on your website are performing well. If you have a low conversion rate, A/B testing and digging into these other website metrics can help you identify problem areas on your site. One way to break down your conversion metrics is to look at whether they are first time visitors or returning visitors. A new user will react differently to your site than a returning customer. New visitors are easily turned off by bad design or poor navigation and will leave your site without a second thought. If you’re having trouble converting new visitors, take a hard look the user experience on your site. A healthy mix of returning visitors is a sign that your website provides value and a good experience. There are a ton of reasons why a returning visitor might not have converted the first time around. Isolating your returning visitors in your metrics helps you discover how to keep them coming back and reduce barriers to conversion. Direct - Visitors who type your exact URL into their address bar. Google Analytics also includes any other sources they can’t specifically identify, like shares from IMs, mobile apps, emails and clicks from https sites to non-https sites. No type of traffic is “better” than another, but they will act differently. Someone typing in your URL directly probably already knows you and what you do vs. someone searching for keywords or clicking through from Facebook. Calculate how each channel is converting so you can focus on your highest performing channels first. Tracking your traffic sources can also help you figure out if your other marketing efforts are working. For example, if you’re ramping up your SEO efforts, you should see an increase in search-driven visitors over time. Or, if you’re really focusing on Facebook marketing, you should see a boost from your Social source. Average Time on Page/Site – how long a visitor is spending on each page, or on the site as a whole. Unless you only have 10 words per page, your visitors need time to read the information on your site. The more time spent, the more engaged your visitors are in digging into your content. Depending on your site, you may have a few other behavioral metrics that can let you know if your users are finding value, such as blog comments, reviews, video views, or adding items to a shopping cart. 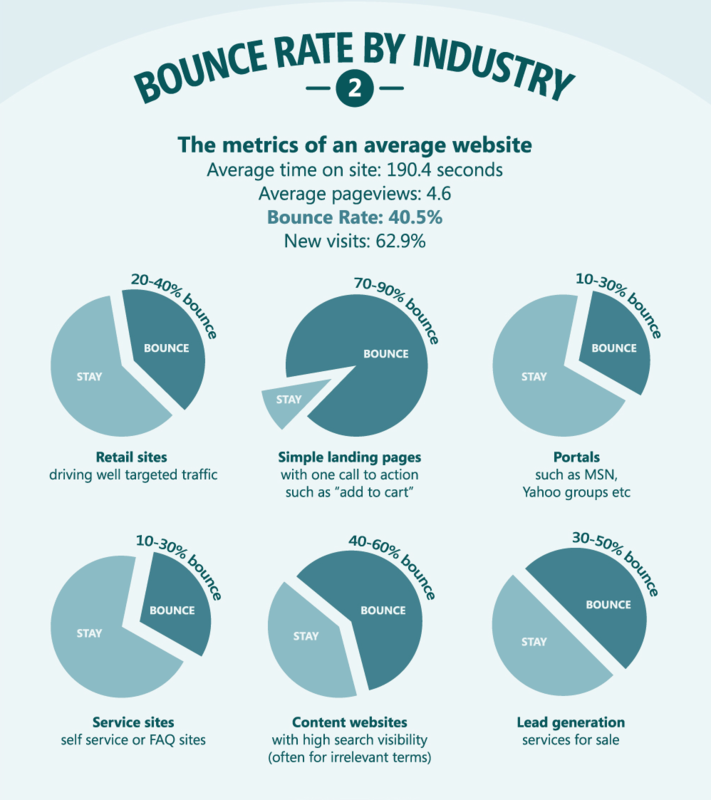 A bounce is when a visitor comes to your site and leaves immediately without looking at any other pages. A high bounce rate indicates that visitors who are coming to your site aren’t finding what they’re looking for. That could be because the content isn’t relevant, the site is poorly designed or it doesn’t work well. Before you panic about a high bounce rate, though, consider your industry and the type of page. For example, it’s totally normal for a blog to have a super high bounce rate (90%+). On the other hand, you should expect a much lower bounce rate for an e-commerce site (around 35-40%). Look for unusually high bounce rates, compared to your other pages. Then you can look at things that may be interrupting the user experience, like confusing content or slow loading times. Exit rate, not to be confused with bounce rate, is the percentage of visitors who leave your site from a particular page. Exit rate focuses on which pages were last in the session. Bounce rate focuses on which pages were the only ones in the session. A graphic representation of bounce rate vs. exit rate. You expect a very high exit rate on the confirmation page. But what if you have a high exit rate on the product page? That might the page isn’t working right, or the product isn’t interesting to your customers. Or, maybe visitors are leaving after they hit the shopping cart, which may mean your checkout process is too cumbersome. Tracking keywords will show you which terms people are using when they find your site in a search engine. Likely your top keywords will be your company name and variations of it. Others will be terms related to your products and services. Unfortunately, Google hides a lot of search queries, but through analytics and the Google Search Console, you can still get a lot of data on your top-performing keywords. Many marketers obsess about the number of visitors to their website – but it’s one of the least meaningful metrics, especially out of context. Yes, of course want to drive people to your website, but you want to drive the right people – visitors who will become customers. Anyone can get more traffic (just advertise that you have the leaked script to the next Star Wars movie). It’s a poor indicator of success. For example, if you’re pouring money into advertising campaigns, you may be driving a ton of web traffic. Does that mean the advertising was a success? Traffic also tends to fluctuate, which may not have anything to do with the success of your website. Were you in the news recently and getting a lot of press mentions? Or did your traffic spike when you were in the midst of a big event? These aren’t bad things, but the increase in traffic is largely a vanity metric. Everyone wants to rank #1 on Google. It’s like the Holy Grail of marketing goals. But few businesses really stop to ask why they want to rank #1, or what that means for their business. Bear with me on this one. First, you need to clarify the goal: what do you want to rank #1 for? You don’t want to base your success on a metric that is impossible to achieve. For most businesses, ranking #1 for their brand name is very achievable goal. Ranking #1 for a keyword might be a very different story, depending on the search volume and competition. If you’re trying to rank for “underwater basket weaving in Lancaster PA” you’re probably OK. Ranking for “running shoes,” not so much. Obviously, a top spot on Google means a lot of clicks – 33% of them, according to studies. That’s a lot of traffic. But then we come back to the point above: are you just getting more traffic? Or is it meaningful traffic that’s converting? Secondly, rankings change all the time. Google changes its algorithms, search volume fluctuates, new competitors enter the scene, and you regularly gain and lose links. It’s natural, and in many cases, it’s beyond your direct control. Do you really want to base the success of your website on such a volatile metric? Ranking #1 on Google is the ultimate vanity metric. Yes, on the surface it’s an indication that your website is providing relevant results. But the ranking itself is not the driving factor that’s going to determine your success. 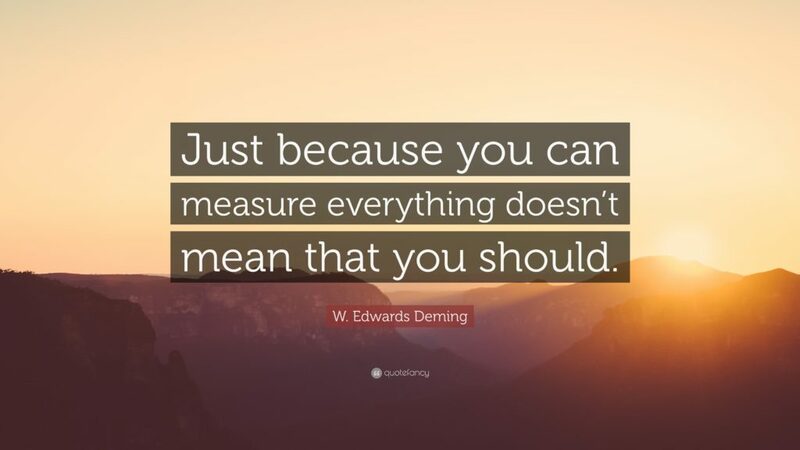 Instead of obsessing over your ranking, why not focus on all the other metrics that help you climb the rankings in the first place? When it comes to website metrics, people tend to look for magic numbers to aim for. What’s a “good” number of pages per session, or what’s the “ideal” mix of traffic sources? Simple answer: it depends. There are a ton of studies and industry benchmarks out there, and those can provide a good reference point. But your business is unique, so make sure you’re looking at your own metrics to establish a baseline. Determine what’s “good” for your business and track your success over time. Also, if you need help getting started with measuring, or you just need some help interpreting the data, give us a call. We admit it, we’re nerds when it comes to numbers.